“Other people’s money.” Think about that phrase for a moment and what it triggers in your mind. For me, the phrase conjures the notion that when one is entrusted with the care of someone else’s money or property, you have to take special care of it, even more so than if it were your own. Do you know who coined that phrase? 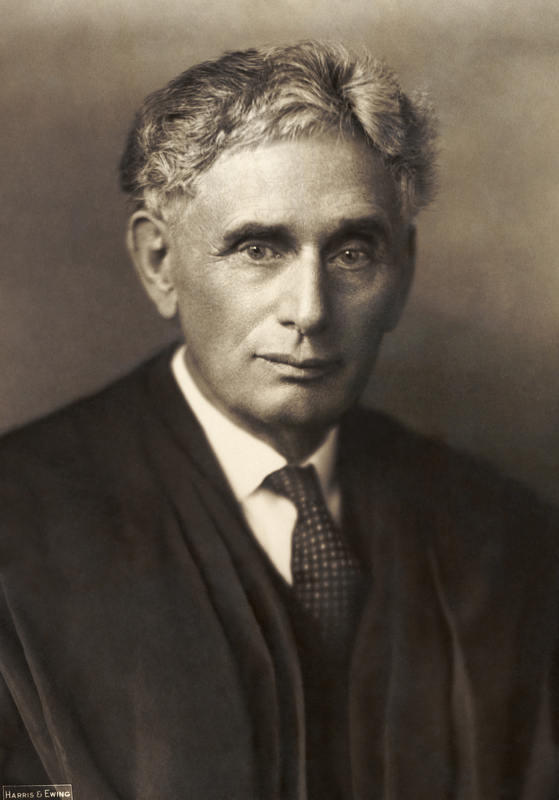 Louis Brandeis, the first Jewish Justice on the United States Supreme Court. This year marks the 100th anniversary since his nomination by President Woodrow Wilson and the start of his distinguished 23-year term as the first Jewish Justice on our nation’s highest court. Jeffrey Rosen, a leading Constitutional scholar and author of the recent book Louis D. Brandeis: American Prophet, describes Brandeis as “the most farseeing, progressive justice of the 20th century, the one whose judicial philosophy is most relevant for the court today as it confronts questions involving regulation in a time of economic crisis and the preservation of constitutional liberty in a time of technological change. On this Shabbat of Parashat Shofetim, it’s natural for us to recall a towering presence in American jurisprudence and one of the most prominent Jewish Americans in the history of this country. However, there are three specific matters in Parashat Shofetim that invite an appreciation of the Brandeis legacy. Other people’s money: The Torah discusses the appointment of a king. Public leadership is necessary for the security and overall welfare of the community. However, unlike other nations of the time, the king is not divine. The king is a human being subject to the Torah’s laws like everyone else. In this context, the Torah emphasizes the importance of integrity of the office. רַק֮ לֹא־יַרְבֶּה־לּ֣וֹ סוּסִים֒ וְלֹֽא־יָשִׁ֤יב אֶת־הָעָם֙ מִצְרַ֔יְמָה לְמַ֖עַן הַרְבּ֣וֹת ס֑וּס וַֽיהוָה֙ אָמַ֣ר לָכֶ֔ם לֹ֣א תֹסִפ֗וּן לָשׁ֛וּב בַּדֶּ֥רֶךְ הַזֶּ֖ה עֽוֹד׃ Moreover, he shall not keep many horses or send people back to Egypt to add to his horses. Integrity of the office mandates not using public funds for personal enrichment. Louis D. Brandeis was passionate about this issue and wrote a book titled “Other People’s Money.” Brandeis was the most important critic of bigness in business and government since Thomas Jefferson. He was a fierce opponent of oligarchs like J.P. Morgan, who took reckless risks with other people’s money by investing in complicated financial instruments whose value they couldn’t possibly understand. Brandeis forecast the crash of 1929 that launched the Great Depression, and his wisdom anticipates the financial crisis of 2008. You shall not move your countryman’s landmarks, set up by previous generations, in the property that will be allotted to you in the land that the LORD your God is giving you to possess. In other words, don’t move the fence between your property and your neighbor’s to add to your field. Why does the Torah have to mention such a specific type of theft? The Torah already stated numerous times that it is forbidden to steal! It is suggested that the Torah is teaching the value of privacy. A fence serves two purposes. It marks the property line between neighbors. It also protects each neighbor from peering into what the other party is doing. Each homeowner can do what he pleases in his yard without feeling that someone is looking over his shoulder. When one moves the fence over and intrudes on his neighbors property he’s not only stealing his physical space, he is also taking away his emotional security. He’s stealing his right to peace of mind. The Torah is more than just a handbook of laws and commandments. It teaches us how to live respectfully with others by ensuring everyone the necessary privacy to pursue his or her individual interests. Rosen notes that Brandeis anticipates FMRI technology, brain scans, things that can reveal our unexpressed emotions. And he’s insisting you can’t just focus on the legal principle the framers were embracing – that you had to break into someone’s house and trespass on their lands – you have to focus on the value they were trying to protect, which is intellectual privacy. So Brandeis is challenging us – take the framers values, translate them in light of these new technologies and make them our own. Finally, Brandeis was a Zionist who rallied the American Jewish community to support a Jewish state in our national homeland. Parashat Shofetim opens: Judges and officials you shall appoint בְּכָל־שְׁעָרֶ֔יךָ within all your gates, in the dwelling places which Adonai you God is giving you (16:18). Two verses later is the clarion call צֶ֥דֶק צֶ֖דֶק תִּרְדֹּ֑ף לְמַ֤עַן תִּֽחְיֶה֙ וְיָֽרַשְׁתָּ֣ אֶת־הָאָ֔רֶץ אֲשֶׁר־יְהוָֹ֥ה אֱלֹהֶ֖יךָ נֹתֵ֥ן לָֽךְ Justice justice shall you pursue, that you may thrive and occupy the land that Adonai your God is giving you. God promises our ancestors the Land, but it must be a place of justice. In the early twentieth century Jews fleeing persecution began rebuilding a Jewish national home. They sought justice and launched the Zionist project to realize the ideals of the Jewish people in control of their own destiny. It’s hard to believe today, but American Jews at the time were not sold on Zionism. Many American Jews a century ago from all points on the religious spectrum were wary of Zionism and concerned about the perception of dual loyalties. Brandeis, on the other hand, championed Zionism and made it an American value. “The highest Jewish ideals are essentially American in a very important particular,” he proclaimed. “It is Democracy that Zionism represents. It is Social Justice which Zionism represents, and every bit of that is the American ideal of the twentieth century.” Brandeis often said: “To be good Americans, we must be better Jews, and to be better Jews, we must become Zionists.” His influence on President Wilson and the British government helped pave the way to the Balfour Declaration in 1917 that was an important milestone in the path to Jewish statehood. On this Shabbat, Jews around the world are reminded of the necessity to pursue justice and build societal institutions rooted in justice. Louis Brandeis was an outstanding Jewish American whose vision for justice reaches into our own generation. We remember him for his personal integrity, his commitment to liberty and his dedication to Zionism, which transformed the Jewish people. He embodied the Torah’s call צֶ֥דֶק צֶ֖דֶק תִּרְדֹּ֑ף. May his memory be for a blessing.